I recently up-cycled a green glass bottle into a rather pretty vase. The more I looked at it though the more it made me think of Christmas. I decided to have another go, this time making some Christmas trees which could be used as festive decorations. I began by painting a few old corks green. While these dried I set about decorating my bottles, labels having been soaked off, with gems, securing each with craft glue. Finally I cut out some cardboard stars, added some glitter for a bit of Christmas sparkle, and attached these to the corks with a cocktail stick and cellotape. 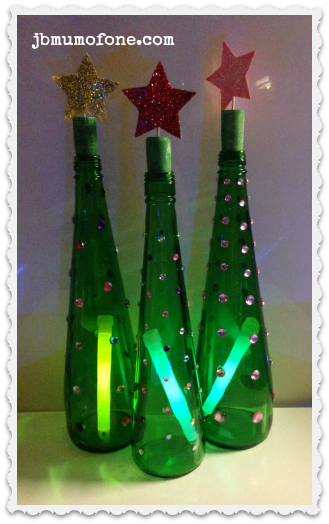 For the evening, I inserted a glow-stick inside each bottle for even more festive fun. 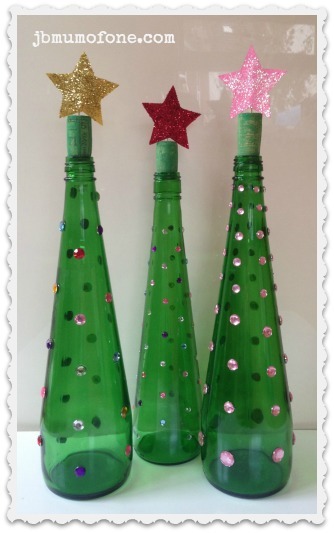 For more Christmas craft ideas why not check out my pinterest board here. Also linking up to Festive Friday over at the awesome Thinly Spread. great idea! can you tell where you get the bottle from? is it Sparkling water? These are so cool! I love the idea of adding the glow stick for nighttime! I really like this idea and it’s something nice that my daughter and ican do together:) great post! They are absolutely gorgeous. I am allergic to craft and I think even I could have a go. What are they? Are they Perrier bottles? They are bottle green cordial bottles Liska but Perrier bottles would be perfect. They are so easy. The hardest part was soaking off the labels LOL. They would make pretty cool night lights on Xmas Eve, I might pop one in the kids room too. Hadn’t thought of that! They look really pretty. I wish I was crafty! Those look fantastic, what a great idea! I’ve got these bottles at home !! What a brilliant idea – I’m going to give this a try. Great! Hope you have fun. They are gorgeous what a great idea. SO clever and so cool! 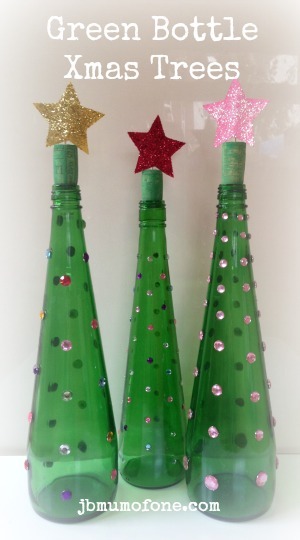 I am ALLL about upcycling and reusing… reducing and all that… so this is a brilliant and super cute idea! Oh how simple and effective Jenny!